Who do you turn to for advice and support? Who around you provides encouragement and counsel when you need it most? If no one comes to mind, consider whether it’s because you haven’t put the effort into developing these relationships or whether you’ve succumbed to a limiting belief – perhaps the idea that you have to go it alone or that you are so far along in your career you no longer need help. The truth is that we can all benefit from mentors, at every stage in our careers as well as in our personal lives. Mentors can help you make better decisions by being a sounding board and providing information and wise counsel. They can help you persevere through challenges by providing emotional support, encouragement, and validation. You can find mentors within and outside of your organization. They don’t need to have power or status to be able to help you and may, in fact, be peers or more junior than you. Developing a diverse set of mentors has the added benefit of exposing you to multiple experiences and perspectives. Mentors make a difference. Work on developing mentors. To begin building your mentoring circle, identify individuals that you want to learn from. Create opportunities to interact with them in a meaningful way, and engage in deeper conversations. Find areas of commonality to establish rapport, show sincere interest in learning about and from them, and ask for their advice on career-related issues. Let them know when you have taken their advice, and what the outcome was. You may schedule regular meetings with some, and with others you may have one or two mentoring conversations around a specific topic. In all cases, express your appreciation and look for ways to give back and add value to them. 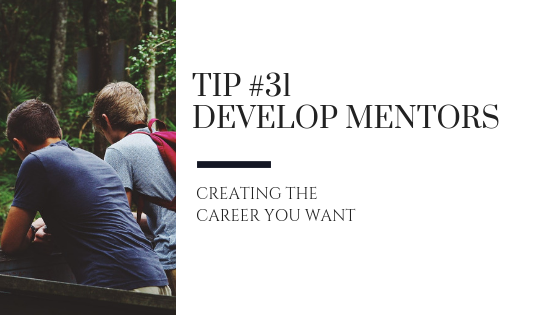 Mentors are important at every stage in your career, so it’s time to develop and build those relationships in order to create the career you want.